Chung & Associates Commission PlanetJ With The AfterMathHelp Relief System . "We are pleased to have partnered with PlanetJ in this effort and selected WOW because of the strength of its framework, and the ability for rapid development." In the wake of recent devastating hurricanes, Chung & Associates have chosen PlanetJ's WOW product to produce a web based disaster relief system (DRS), AfterMathHelp. This system will be deployed to manage disaster relief efforts in ravished communities. The new system is targeted for use in the 2006 hurricane season and will be used in a joined partnership with the Mississippi Baptist Relief Organization and Covenant Community Church in Orlando. Provide disaster relief centers, running on as little as a laptop and generator, a powerful means to efficiently coordinate victims, volunteers, and relief organizations. Built on PlanetJ's WOW and able to be deployed quickly and easily to any available machines, the Aftermath DRS will allow relief workers to respond at a moment's notice. After being deployed to available machines, the Aftermath DRS will then be distributed to disaster relief centers to register and track victims and their needs as well as incoming volunteers and relief organizations. Relief workers will report to these centers where they need to receive work tickets from the DRS according to their specific abilities and expertise. The relief center coordinators should have easy access to reports and queries allowing them to track relief progress and find life-saving information in a matter of seconds. PlanetJ's WOW product, a rapid application development tool, includes a 'self-service' component that allows the easy creation of web applications from existing iSeries, Oracle, SQL Server and other relational database files. WOW installs over the industry standard, Apache Tomcat, application server (as well as many other application servers, including IBM's Websphere) and significantly decreases the time required to develop the application. 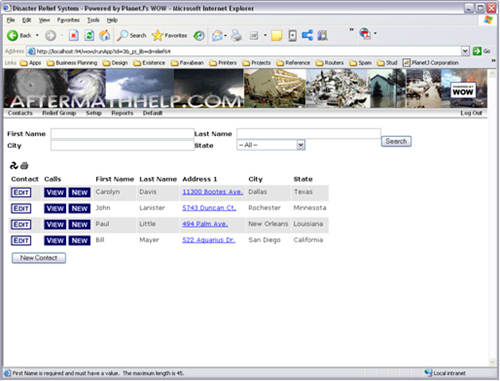 First, an administrator/relief worker sets up the AfterMathHelp system by adding all necessary user accounts, relief center information, and so on. Once setup is complete, designated relief workers (those setup with Aftermath accounts), can sign on and begin entering contact information, call information, and needs for the disaster victims. 1. The woman contacts an AfterMathHelp equipped relief center, in person or otherwise, and informs them that her house has been flooded, leaving her family with no place to go. 2. Her name, contact information, directions to her home, needs and all other pertinent information would be entered into the AfterMathHelp DRS. 3. A relief organization or group of individual relief workers, all registered in the AfterMathHelp system and whose skills matched the needs of the woman, would be assigned a relief "ticket". The ticket would have all necessary information as well as directions. If Internet Infrastructure is available the ticket will also include a Google map for the exact location. 4. This group would provide the needed assistance, making it again inhabitable for the family. 5. After reporting the status of their assignment back to the relief center, they would then be assigned another ticket. In this fashion, the AfterMathHelp system is able to coordinate all available relief workers in an organized and efficient manner. Any number of relief groups and workers will now be able to work together in a focused and cooperative manner. The needs of disaster victims will no longer get lost in the myriad of lists or "systems." Afterwards, statistics can be retrieved from the AfterMathHelp system and analyzed to further improve the relief efforts. The WOW 6.4-based AfterMathHelp system will, by default, be deployed standalone on Windows PCs. However, if necessary, WOW (and thus AfterMathHelp) is capable of being run on virtually any platform and any application server that supports Java servlets and JSPs. Running on top of the Apache Tomcat application server, it will access system metadata and store disaster data on the local MySQL database. Both Tomcat and MySQL are included in the WOW installation. The AfterMathHelp DRS was born literally in the aftermath of a catastrophic storm. After hurricane Katrina Disaster Relief teams began the overwhelming task of bringing relief, resources, and rescue to the victims of the disaster. In an amazing response effort, people moved into the devastation in an attempt to help people rebuild their lives. As people began to reach out for help it was discovered that there was no standard system in place to track the calls for help. Now, with the help of PlanetJ and WOW, this is no longer true.